This blogging thing is harder than I thought. When I’m actually doing something blog worthy, I’m too busy to post. Then when I have time, it’s days later. So let’s warp time and pretend it’s Tuesday. Tuesday is for Spinning. Many spinning/knitting blogs designate Tuesdays for spinning. I didn’t want to copy them necessarily, but I actually DO spin on Tuesdays. 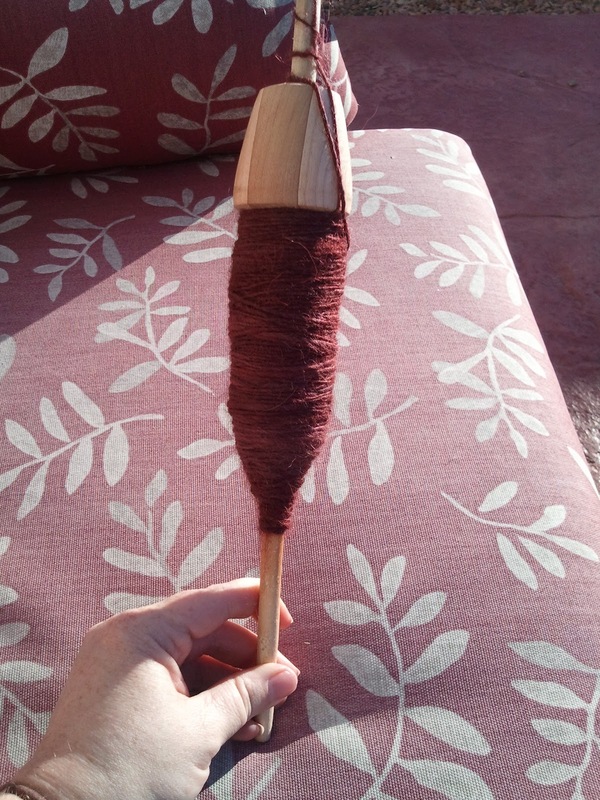 The third Tuesday of the month is when my Spinning Study Group meets at Green Valley Weavers and Knitters. My friend Char (the same Char who introduced me to spinning) is a member, and suggested I come to increase my knowledge. The women have been incredibly welcoming; some are strong at dying, others at fiber prep, and they ALL seem to be amazing spinners. I don’t recall what conversation led to a spinning lesson at Char’s house, but there were three of us initially interested. Char knew that I knitted and crocheted, and convinced me that learning to spin was just part of the natural progression. I bought it hook, line, and sinker. Two of us ended up going over to Char’s house where she had a few of her wheels set up (she has like 14! between the new and the antiques), and fiber for us to start with. We began just treadling the wheels to get used to the rhythm, then we picked up the roving and she showed us how to draft the fiber and spin “from the fold.” I was horrible! It was like trying to walk, pat your head, rub your tummy, and solve differential equations all at the same time! It didn’t matter, I was hooked. Char gifted me with a drop (or unsupported) spindle and some beautiful fiber. I tried to spin for 15 minutes every day, and when I’d spun up all the fiber, I met with her again so she could show me how to ply. Basically, yarn is just fiber that is spun into singles (single ply) in one direction, and then multiple singles twisted together in the opposite direction create 2,3,4,5-plies, etc. as desired. A cabled yarn takes multiple plied strands and twists them together. And this is just the basics! Between lessons with Char and watching all I could on YouTube, I got the basics down. I think. I still try to spin on my spindle several times a week, and am in the process of actually making a yarn I intend to knit with. Yeah! Progress! I’m currently working on plying my maroon wool singles together, and am spinning singles of a mixed brown/white Blue Faced Leicester wool. BFL is a good all purpose wool, which will spin into a medium-thick yarn (hopefully). But I’m still learning as I go, and attending the Spinning Study Group gives me something new to think about and process every month. After discussing the topic of the month, we have Show & Tell. This is my favorite part! Everyone passes around their recent spinning or knitting projects, and while they’re talking about fiber prep, spinning and draw method, I’m indulging myself squishing all the pretties. Sometimes it’s hard to pass the batt or yarn on. I think one of the reasons I fell in love with spinning almost immediately is because of how it appeals to my tactile self. Who doesn’t love petting soft stuff?